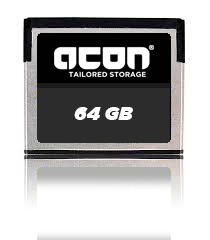 This new acon Industrial CFAST flash memory card comes with SATA 6.0 Gbps interface for higher performance and is compliant with standard Cfast specifications. acon Seal CFAST Card is resistant to practically any environmental danger. The metal case encloses and protects the core, and a special sealing compound hermetically seals the sensitive electronic components within and protects your data reliably against liquids, dust, dirt, shock and vibration. This new flash memory card comes with SATA 6.0 Gbps interface for higher performance and is compliant with standard Cfast specifications. Featuring CorePower technology, Apacer SM22P-CFast has been proved capable of protecting data from sudden power loss after conducting comprehensive testing. 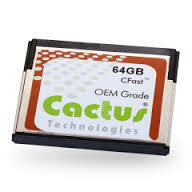 Cactus Technologies OEM Grade CFast are highly reliable, cost effective flash storage devices, based on Pseudo-SLC (pSLC) NAND. The Innodisk CFast 3SE operates at SATA III 6.0 Gb/s, which offers data transfer rate of read up to 470MB/sec. and of sequential write up to 250MB/s. 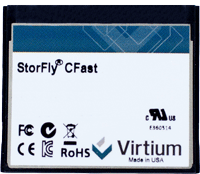 Virtium CFAST Cards match the storage requirements of industrial automation, networking and medical applications that demand high performance in a small, framed form factor. 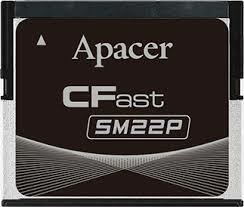 CFast is the same footprint as a CompactFlash, but offers a plug-in SATA interface. CFast SSDs can be used in either fixed or removable devices, but unlike moving to SD, most ATA-based software can be directly leveraged into new SATA CFast designs.